According to a New England Journal of Medicine study, 34% of Medicare patients were readmitted to a hospital within 90 days of discharge, and 56% were readmitted within one year. As the healthcare landscape continues to evolve, MTM knows that health plans have two overarching goals: improve healthcare outcomes and reduce overall medical spending. Our preventative care services provide the early intervention support to achieve these goals, helping health plans engage members and divert them to more appropriate care resources. After identifying high risk members, such as those who frequently utilize emergency room and urgent care services, our dedicated Care Coordinators create care plans that encourage members to utilize primary care services. Through initial discharge planning and continuing member education, MTM can assist your health plan in migrating to an outpatient care-focused model that helps achieve quality improvement goals, curb avoidable readmission penalties established by the Patient Protection and Affordable Care Act, and avoid costly hospitalizations and emergency room care. Appropriate discharge planning is the key element to ensuring members receive follow-up care from their primary care physician—not the hospital or an urgent care facility. 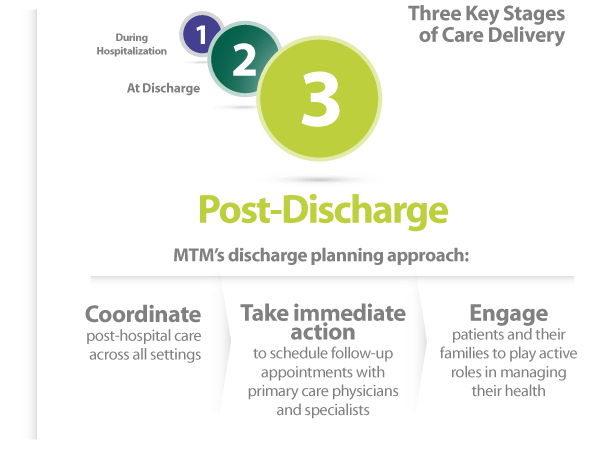 MTM’s robust discharge planning approach focuses on post-discharge, beginning early to promote member self-management of healthcare and connect members to the care they need to remain healthy outside of the hospital. Members are often ill-prepared to return home after a hospital stay. Our Care Coordinators perform an in-home needs assessment to determine what services the individual needs or what environmental modifications may be required to ensure safe mobility and promote improved outcomes. Based on the assessment, MTM coordinates transportation, pharmacy delivery, and other services that may be necessary to help the member gain independence while preventing unnecessary hospital readmissions. Our professional, trained, and qualified staff provides comprehensive care coordination and planning following hospital discharge to deliver appropriate, timely care interventions. Care Coordinators develop robust transitional care plans that ensure continuity of healthcare as the member’s needs change during the course of a chronic or acute illness. MTM helps members stay independent, and educates their family and caretakers on the importance of adherence to the care plan to minimize unnecessary re-hospitalizations. Through our robust emergency room diversion processes, MTM can help you reduce inappropriate expenditures by identifying and educating members who unnecessarily or frequently utilize emergency room and urgent care services. This begins by analyzing your membership to identify frequent fliers, or members who over utilize emergency care. Familiarize themselves with the member’s background and individual medical situation. Conduct a telephonic assessment with the member to determine underlying issues that drive inappropriate emergency use. Create a care plan that connects the member to the most appropriate, cost-effective services and resources for their condition; these services are typically provided by a primary care physician or specialist. Provide ongoing education to promote a relationship between the member and their primary care physician, and teach members when it is and isn’t appropriate to utilize emergency care. Follow-up with the member at regular intervals to ensure they keep scheduled appointments, remind them to take their medications, and offer general support. Provide re-education as necessary based on recurring use of emergency room and urgent care services. In addition to providing outbound support, MTM’s Care Coordinators are also available to serve as a health plan resource, accepting inbound calls from members with inquiries regarding their care. Our diversion process is successful because we engage members, develop a care plan that connects them with the appropriate medical resources, and provide 24/7 support to ensure adherence.